Any alcohol aficionado will attest that ice cubes melting into your cup of 20-year-old Scotch will put a big frown on your face. There’s no reason to chug it just to avoid the disappointment of diluted liquor, though. 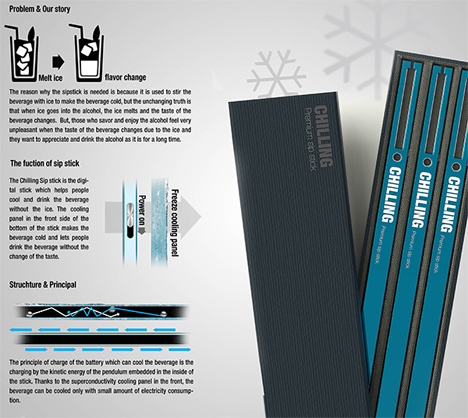 A very cool concept from designers Seung Hwan Roh, Chan Jae Joh, Yeon Ho Chu and Na Rae Park could chill your drink without the need for ice. 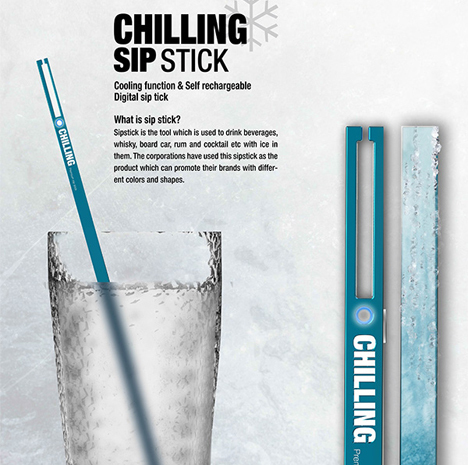 The Chilling Sip Stick is a digital straw that cools your drink as you sip it. The electronic device includes a cooling panel in the front side of the bottom end. As the liquid flows through the cooling panel, it lowers in temperature, making it tastier without watering down your delicious beverage. 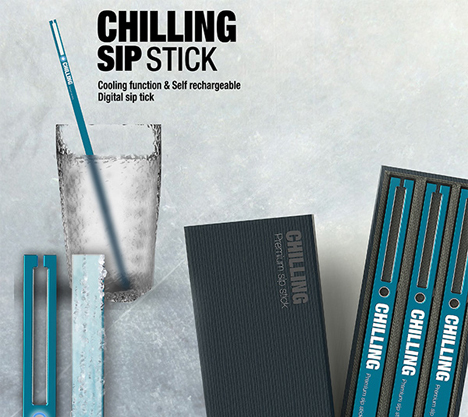 The designers don’t offer up much information about how the stick actually works, but they call it “self-rechargeable.” They envision it as a possible marketing tool that corporations can brand with their information and logos to spread brand awareness. No matter how it works, we’re eager to get our hands on a pack of them. See more in Unbuilt Concepts or under Technology. December, 2014.